Abdullah is the line-up of Jeff Shirilla (vocals), Alan Seibert (guitar), Ed Stephens (bass), and Jim Simonian (drums); they are out of Richfield, Ohio. As it is understood, Abdullah was the recording name vocalist Jeff Shirilla went under before it found itself as the name of the current band line-up. When it comes to the sounds or musicality of the group, there is a little hesitance about what to say concerning the "Graveyard Poetry" release. It may be a delight for certain types of rock/metal fans but I don't see the material (musically and lyrically) being a clean enough break from current and notorious trends in alternative rock/metal for it to be convincingly distinct. To stray away from comparisons, it can be said that the group doesn't seem to find memorable songwriting or a defining sound to create a distinct musical place for itself. Even with this said, the vocalist is solid and the musicians do play competently nonetheless. There is a point on the disc that brings more of this to light on the high-energy track "They, the tyrants." It is a song in the thrash metal playing style with death vocals to boot. In total, "Graveyard Poetry" falls short of creating enough standout moments to make it memorable. In closing, Abdullah needs to hone musical individuality first, to avoid being lost in the shuffle. 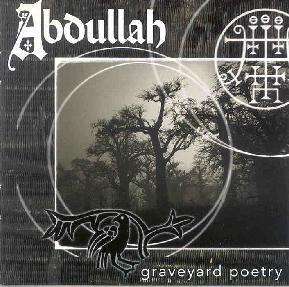 For more information you can visit the Abdullah web site at: http://www.stonerrock.com/abdullah. Graveyard Poetry is distributed by Meteor City. You can visit their web site at: http://www.meteorcity.com.